All the up and coming Events can be viewed in the Events feed on this page, below is the current and historic news, events & courses. This is an annual event held at the Royal Free Hospital, it is an excellent opportunity to support learning and development. The concept of this event is for the nursing staff of the different specialities within the trust to promote their service and to educate their colleagues as well as to provide advice and support. It's an opportunity for teams to network with each other and establish similar working practices that they may not have known existed before. It's a chance to drop in & talk to specialist staff for advice & support, ask questions about policies & practices, check knowledge & test clinical skills and to also support CPD requirements and prepare/collect evidence of learning for revalidation. This event has only been running a few years and this was the first year that Immunology attended, their were 31 stands at the event in total. 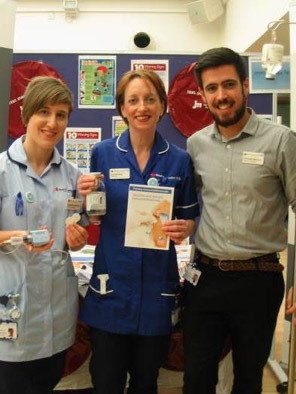 The event was a great success and the immunology stand was well attended, we were pleasantly surprised at just how many wards administer immunoglobulins and how much interest there was in the general administration but also regarding home therapy. Hopefully we will manage to continue to attend so we can continue to educate and increase awareness of Immunodeficiencies and the treatments available.